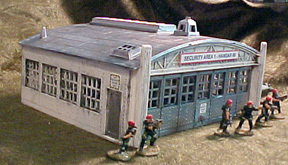 I picked up the Plasticville Hangar as part of a lot on ebay a few months ago. Right now I have another on the way, as part of another lot. At this rate, I'll be able to field a military/scientific complex being raided for it's secrets. 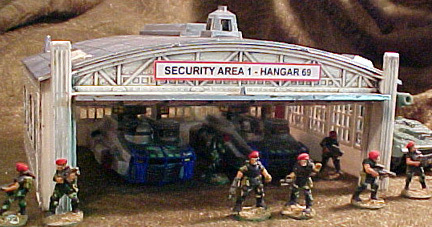 It won't be a bad table, as the hangar is actually a pretty good-looking kit. Not a complex kit by any means: There are 4 walls, 3 doors, a roof and a windsock: 9 pieces all told. It's another lazy painter's dream. 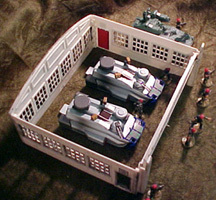 The 4 walls snap/glue together, and can be spray-painted whatever colour you choose. I thought of silver, but opted for white. I spray-painted the doors silver, and snapped them into place. 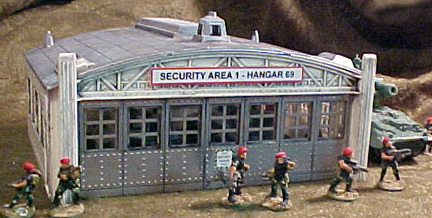 Like every other Plasticville building, the hangar is marked with embossed letters: In this case, 'Plasticville Airport'. IN 3/4 INCH HIGH LETTERS ON THE ROOF. I weathered the piece with black, brown, and ochre acrylics, painted on & wiped off, using paper towels and occasional sprays of 'Fantastik'. I created and printed the front sign (10cm x 1 cm) to cover the embossed sign above the main door, and security access signs for the door itself and the side doors. 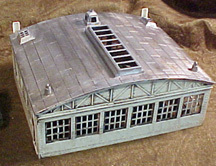 The roof is detachable, and the front door opens to reveal the treasures within. Although it's a fair size, the building looks bigger than it is: The plan is only 8 1/2 wide x 7 /14 deep. Or so the Conpiracy Theorists would tell us.